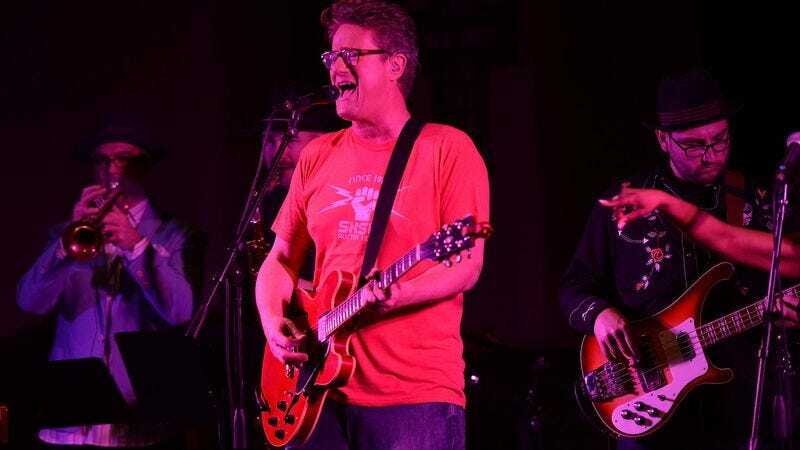 After decades of being just another struggling rock musician holding down go-nowhere day jobs in cable news and the U.S. House of Representatives, Joe Scarborough is at last getting his big break, gearing up to release his debut EP this Friday, June 23. This 54-year-old upstart—backed by his scrappy little nine-piece band, brass section, and professional back-up singers—has long paid his dues by slumming it in residencies on the Upper West Side, cutting his teeth and dodging broken wine-glass in front of tough, Arianna Huffington-filled crowds. But with the release of Mystified, that grassroots following finally seems poised to explode nationwide, bringing in new fans from every city’s members of the media and political elite. For all his fellow musicians, it’s a testament to the power of just following your dreams, until you are considered famous enough for a separate thing that others will feel obligated to indulge them. Though Mystified is the first official Joe Scarborough release, collectors have long traded bootlegs of his legendary sets at New York’s Prohibition NYC, where he gives classic songs like “Play That Funky Music” and Prince’s “Kiss” the kind of raucous, wild-man energy that can only be conjured by a man whose gingham shirt is fully untucked. And of course, there are his originals—more than 400 total, Scarborough says, which he plans to begin releasing “in waves with an EP every month for the next four years.” Currently Scarborough’s website, ScarboroughMusic, contains only tantalizing teasers for three songs—“L.A. Song,” “Downtown,” and “Girl Like That”—whose titles confirm that, despite his buttoned-down, middle-aged Republican persona, Scarborough is definitely familiar with girls and cities. It’s that raw, girl-knowing-and-urban-center-visiting charisma that’s already attracted a fervent groupie following among his co-host/fiancée Mika Brzezinski. While you’re waiting to get a full taste of Mystified and its 47 follow-ups, you can whet your appetite with some choice live cuts from Scarborough’s career—all the way from his days doing DIY basement shows at The View, where he boldly came out against 9/11 with the protest song “Reason To Believe,” to his recent gig at SXSW in Austin, Texas, where many a young musician goes to be discovered while everyone is busy watching the vanity project from the guy from MSNBC so they have something to tweet about. It’s an experience Scarborough later documented in the authentic, road-dog anthem “Austin, Texas,” just one of the many cities Joe Scarborough is familiar with. For those of you lucky enough to live in New York—that big, bright town filled with sidewalks and taxi cabs and other things Joe Scarborough documented in a song called “New York,” probably—you can catch the Scarborough band playing an EP release show this Thursday, June 22. Admission is free, which means you should definitely arrive early. Lots of people work for MSNBC.